I came across the Cross Ion several years ago when I found it in a college bookstore discounted to 5 dollars and immediately purchased it. The small portable design was unlike anything I had seen before and its futuristic look of opening and closing the pen had me hooked. The pen was the perfect size to carry in my pocket without it being too distracting. I only used this pen for a brief amount of time because of the one main drawback which is the large point size. 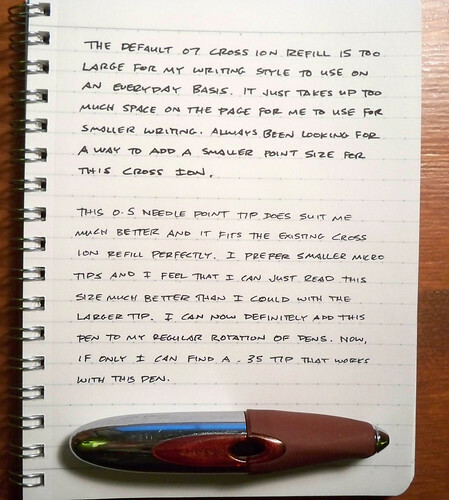 The only available size for the Cross Ion was the 0.7 mm refill which is too large for my writing style. There was no way to add a smaller refill size from other pens because you could only use the non-standard refills made specifically for the Cross Ion. Cross had never offered a smaller point size with this pen for those of us who prefer a smaller size. It had been since shelved and forgotten into my collection of pens. I recently came across it again in my reserve stash of pens in my office. It had such a cool design that I really didn’t want it to go to waste. I was determined once again to find a way to use the Cross Ion with a refill that was smaller than a 0.7. It occurred to me to just try to find a replacement tip for the pen instead wasting my time with refills that would never fit properly. After several failed experiments trying different tips from my collection of pens I finally found a solution to my problem. The tip from retractable version of the Office Max TUL brand 0.5 needle point as well as the retractable Energel X needle point fits the Cross Ion perfectly. Here is a simple and easy 5 min guide to convert to a needle point tip for the Cross Ion. - One TUL 0.5 needle point refill. - One Cross Ion refill. - A cloth over work area in case some ink spills. - Take a pair of pilers and grab the side base of the metal tip, not the needle point part. - Do the same with the metal tip on the Cross refill. It should put out with some minor pressure. - Use the pilers to insert the new tip in the Cross refill; it should snap into place perfectly. - Enjoy your new needle point Cross Ion! View the entire Cross Ion Mod photo set on Flickr. Cross Ion refills can still be purchased off Amazon and the Cross website. Some Staples stores still carry these refills but they can be hard to find. I tend to buy multiples of the things I like, so I think I grabbed 3 when I saw them last at Staples a few months ago. I’ve tried to find something smaller around the .35 range but was unsuccessful. This is the simplest way to change the larger point size without having to mod the existing Ion refill or replace it all together. So far, the TUL 0.5 needle point tip works perfectly with the Cross Ion. 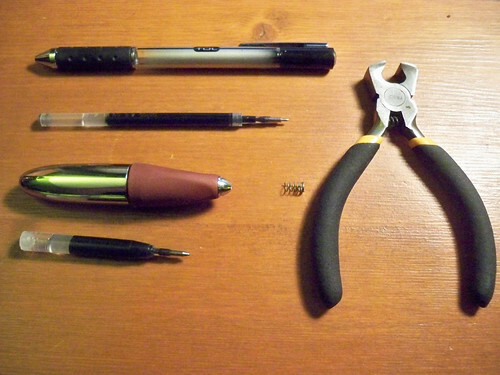 Posted on February 20, 2012 by Brad Dowdy and filed under Cross, Ion, Mods, Pen Reviews.